Will the Optimus G's successor show up at CES? LG is putting its pre-CES hype machine in full gear at the last minute, launching a video teaser with hints of what it will show in Las Vegas next week. The highlight of the teaser is a very brief glimpse of a smartphone, which shows the sleek corner of a device with a thin bezel around the screen. The smartphone shown is believed to be the LG Optimus G2, a rumored 5-inch follow up to the Optimus G.
The rumored handset is said to pack a 1920 x 1080 resolution display with 440 ppi, putting the 5-inch display to good use for a full HD smartphone. The video doesn't reveal very much else of LG's CES lineup, though that may be because some of it is already known. Last month, LG jumped the gun a bit when it announced it will debut new GA6400 and GA7900 Google TV-equipped television sets at the Vegas event. The GA6400 will arrive in 42-, 50-, 55-, and 60-inch models while the GA7900 will have a more premium low-bezel design in 47- and 55-inch varieties. LG has yet to officially confirm the Optimus G2 existence, though a benchmark leaked last month indicates that it could arrive quite soon. The prevailing rumor is that the G2 could launch as early as May 2013, which would help it compete against 1080p handsets on the way from other manufacturers. 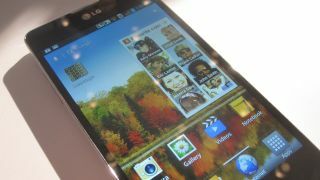 With 1080p smartphones already expected at CES from the likes of Samsung and Hauwei, all signs seem to point at the LG Optimus G2 sitting along with those devices on the show floor. We'll know for sure on Jan. 7 at 8 am PST, when LG holds its CES press conference.